Glove Lady Gloves & Safety Products franchise business opportunity. Free Glove Lady Gloves & Safety Products business franchise information. 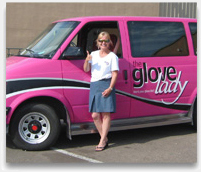 Glove Lady takes specialty gloves and safety products out of a dull, boring catalogue, and brings them to life in a brightly colored van. It's a rolling safety products store, hosted by YOU, with try-ons strictly permitted! When you roll into town in the bright pink Glove Lady van, you'll be a welcome sight. Why? Because you'll be the Mary Kay of safety products, a Sear's catalogue-on-wheels for work gloves, gear and goggles. It's fun for you, fun and super-convenient for your customers, but most important; a Glove Lady franchise is HIGHLY PROFITABLE. Make money from day one as a Glove Lady or a Glove Guy-our more subdued package for male reps - and get in early on a "sure thing." It's a Multi BILLION Dollar Market with UNLIMITED UPSIDE - According to the latest statistics from the US Census Bureau, the safety glove and product market is over 3 billion dollars strong - and growing. It's Recession-Proof - People will always need safety apparel and gear, and demand is increasing due to long-term worker safety laws and regulations newly in place. Glove Lady products are required in almost every industry. The Market is Far From Saturated-It's Underserved! - Maybe you had a friend who told you to invest in real estate before the boom, or a relative that made a killing on eBay selling collectibles before every neighbor on the block followed suit. Now those markets are saturated! There is No "Eight Hundred Pound Gorilla" in the Glove and Safety Products Market- …And that's good news! There is no Wal-Mart or Home Depot-type superstore or mammoth J.C. Penney-sized catalog in the safety products industry. And there's been NO personalized service-until now! Another Glove Lady first! Glove Lady has one of the Lowest Start-up costs in the franchise industry. The Glove Lady/Glove Guy offers necessary items that need constant refilling. Get started with low inventory. Making Sales with Glove Lady is as simple as just showing up! Glove Lady is revolutionizing the way commercial specialty glove and safety products are sold. There's never been anything like it. And what's more, you don't have to be an expert in gloves and safety products, or even an experienced salesperson. Just like office supplies, businesses and individuals know exactly what they need, so the products sell themselves. Glove Lady is for you! We look forward to welcoming you to the Glove Lady family. Then the next time someone asks "How's your glove life?" you'll say, "Darn good!" To learn more about the Glove Lady Gloves & Safety Products franchise opportunity, simply complete the form below.